Home » Backup or Back up – What’s the Difference? Is there a difference between the single word backup and the separated words back up? Actually, there is. Even though these terms are almost identical, they function as different parts of speech in sentences, so you can never substitute one for the other. 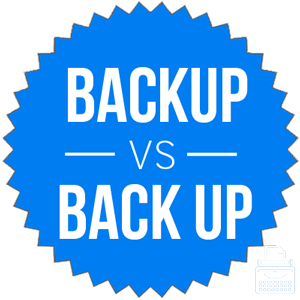 What is the Difference Between Backup and Back up? In this post, I will compare back up vs. backup. I will use each of these spellings in at least one example sentence, so you can see them in context. Plus, I will show you a memory tool you can use that makes choosing back up or backup a little easier. What does backup mean? Backup is a noun, and sometimes an adjective. As a noun, backup refers to an extra or secondary version of something. In computing, for instance, a backup is a copy of information stored separately, in case of hardware failure or other data loss. Kayla does a weekly backup of all her personal files to an external hard drive. If Plan A fails, don’t worry; we have a backup in place. Another example of backup as a noun might be in the context of police or military units. The convoy of marines was under attack, so they called for backup. As an adjective, backup describes the quality of being extra or secondary. A backup generator, for instance, is an extra generator that will still supply power if the primary generator fails. A backup catcher can replace the starting catcher on a baseball team if the starter needs a day off or sustains an injury. One famous rapper boasted that he has a backup plan to his backup plan, to back up his backup plan. Many cyclists carry a spare tube with him as a backup plan in case they get a flat tire. Sometimes, when used as an adjective, backup is spelled with a hyphen: back-up. What does back up mean? Back up is a verb phrase. In one sense, it means to support someone or something in an auxiliary role. True friends will always back up their friends in a fight, even if they know they will lose. In another sense, back up can mean to make a copy of information on a computer, like in one of the noun senses of backup. Back up all your files to the cloud so that you can access them from any device. Back up the truck so we can load the mattresses without walking so far. Back up is a verb phrase, while backup is a noun and an adjective. Keep in mind that back can be a verb all by itself, even in phrases other than back up. Consider the phrase back off. Backup vs. Back up Check: By remembering the parts of speech of the separate words in this phrase, you can easily remember that back up is a verb phrase. Is it backup or back up? All that separates the spelling of these words is a single space, but they do function as different parts of speech. Backup is an adjective and a noun. Back up is a verb phrase. 1 What is the Difference Between Backup and Back up?